WJ Linkline Group, the UK’s largest specialist road marking contractor, has successfully achieved Bronze accreditation from the Fleet Operator Recognition Scheme (FORS). 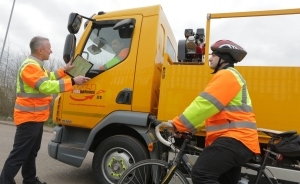 FORS is an accreditation scheme led by Transport for London (TfL) and is designed to improve vulnerable road user safety across London and throughout the UK. With an alarming number of serious and fatal injury accidents involving cyclists and other vulnerable road users, TfL now expect all drivers of vehicles on their London Highways Alliance Contracts (LoHAC) with a gross vehicle weight of over 3.5t to undertake the FORS-approved driver training for Safe Urban Driving (SUD) within 60 days of a contract start date, unless they have undertaken similar driver training in the last three years. In 2013, there were 14 cyclist fatalities in London with nine incidents involving large goods vehicles (LGV), which again highlighted the need to take measures to improve road safety and increase awareness of the risks when travelling or working on our busy transport networks. In addition to driver training, FORS also introduces an established standard for LGVs operating on the TfL network. This includes additional signage on vehicles to warn cyclists of potential dangers and driver aids to improve visibility in ‘blind spots’. W J Linkline director Paul Aldridge said: "TfL are committed to improving the safety of all vulnerable road users in London and a growing number of our main contractor clients, including Skanska, Costain, CVU, EM Highways and Lafarge Tarmac, have communicated their support for the FORS scheme. "This is encouraging for us as we too strive to be at the forefront of safety standards in the road marking sector and show our support for wider campaigns, such as British Cycling’s #Choose Cycling and the AA’s ‘Think Bikes’. "Following our proud delivery of the London 2012 Olympic and Paralympic route network markings for TfL and more recently, in our role as road marking contractor for EM Highways and CVU (a joint venture between Colas, VolkerHighways and URS) on the LoHAC South and Central respectively, we have established a permanent presence in London with a new depot in Croydon. "All our London based drivers have received SUD training, which is to be expanded to all WJ Linkline Group drivers, to ensure uniformity across the business." WJ Linkline Group owns and operates 205 vehicles, including 120 LGV road construction vehicles and has recently set up a Driving Standards Agency (DSA) approved driver training division, providing internal and external LGV driver training, as well as introducing a series of industry-related driver Certificate of Professional Competence (CPC) courses. W J Linkline Group managing director Wayne Johnston said: "We are proud to have been successful with our FORS application and in achieving bronze standard. "Our industry has an entitlement to exemptions from MOT testing and LGV driver qualifications but we are committed to safety standards beyond our contractual requirements. Three years ago, we made a corporate decision to undertake a comprehensive programme of LGV driver training and at the same time, commit to having all our LGV road construction vehicles MOT tested in line with the requirements for all other LGVs. I believe that this commitment is unique within the road marking industry and provides a safer work environment for our operatives and all road users in general. "We have invested more than £10.5m in new vehicles and training over the last three years and we are continuing that investment so it is reassuring to know that the risks associated with a growing fleet are being effectively managed to the highest standards." W J Linkline Group transport manager Scott Logan said: "I am proud to be part of an organisation that is so committed to safety and so forward thinking. The FORS scheme helps me standardise and control how we manage our fleet and work related road risks across the group." It is expected that the improved safety standards being set in London will soon be adopted by other UK authorities and make our roads safer for all users nationally, while reducing the impact of our LGV fleets on the environment at the same time. For more information, please contact WJ Linkline Group.